We’ve heard a lot about the 2017 Ford Raptor “optimizing itself” for different driving situations. This week between canyon carving and sand-sliding sessions, we sat down with an engineer to find out what’s really going on when you push this truck’s magic buttons. The new Raptor has an impressive 450-horsepower engine, 10-speed transmission, unique high-strength frame, long-travel suspension and a beautifully appointed interior. But the Terrain Management System that dials the truck in between six different surface-type settings is the keystone of turning the vehicle into a holistic system of all-terrain dominance. Practically speaking, the Terrain Management System can change how the gas pedal responds, where the transmission shifts, how much resistance is built into the steering sensation, which drive wheels are active and when the differential locks both rear wheels together. 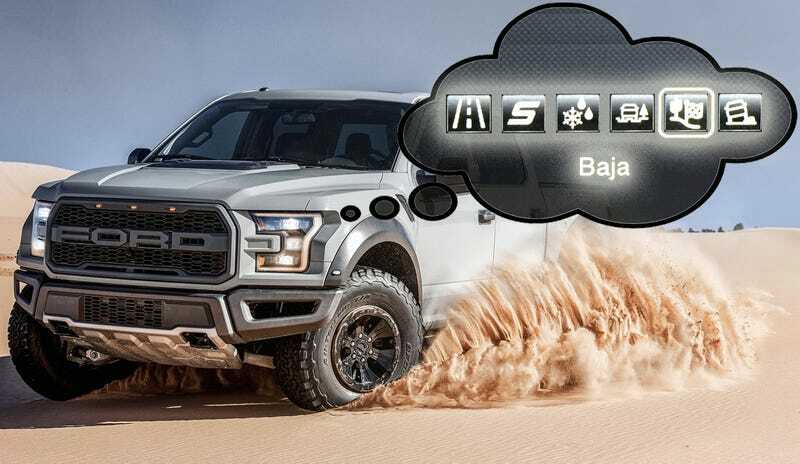 The Raptor’s default setting is rear-wheel drive, with a neutral-feeling throttle response and shift points set to hit a balance between fuel economy and acceleration. Auto start/stop will be active, though that and the driveline’s setting between 2WD and 4WD can be user-overridden. This is the setting you’ll be in every time you start your truck. Only the 4WD system, since it’s mechanical, will remain the way you last had it through a key-cycle. The gas pedal is “front-loaded” to make throttle response more dramatic. Shifting is adaptive, meaning the transmission will hold gears longer than Normal mode but will shift into a higher gear whenever possible. Steering, which can also be dialed independently, is set to “Sport,” which adds resistance to the helm. Traction control is at its normal rate of intervention. The throttle is muted, meaning the truck won’t accelerate as hard when you put your foot down. The idea is that this will help you avoid spinning your wheels into oblivion while you’re stuck in snow. The transmission shifts short to keep engine speed as low as possible while keeping you moving forward. Traction control operates on a heightened aggressiveness. Basically the system is quicker to cut power if it detects slight slips or yaw. The 4WD system is set to “Auto” here which allows the truck to behave like some AWD vehicles, sneakily sending power to front wheels when sensors decide that can help the traction situation. The Raptor’s configuration for low traction, high-power situations puts the throttle at a moderately aggressive setting between Normal and Sport. Shifting is similar to Sport where gears are held a little longer, but will shift up if the system detects you can carry on without the power of high-revs. Traction control is essentially off to let the tires freewheel a bit, since you don’t want to lose power just as you’re climbing out of a sand bog, but stability control will still be in place. Steering is set to “comfort,” which provides the most assistance. That means the front wheels will turn harder with less driver input. Behold the beast mode: “Baja” puts the Raptor’s throttle response at its most direct setting, holds the RPMs as high as safely possible to squeeze every drop of energy out of the turbocharged 3.5-liter V6 EcoBoost engine and relaxes the traction/stability systems to allow for the most yaw and slide it deems safely possible. The drivetrain is set to 4WD high automatically, but you can override and set to 2WD for the full Baja 1000 racing experience. Steering is actually set to “Normal,” giving you more neutral resistance on the wheel since deep sand tends to push back more than the pavement. In my time with the Raptor off-road, this was the setting to put the biggest smile on my face. It instantly multiplied my intermediate driving abilities, taking me confidently to highway speeds through soft, twisty desert scrubland straight out of my Baja fantasies. And unlike my actual Baja experience, I wasn’t in moderate to significant physical and emotional distress for most of the time. I was cool and comfortable in a climate-controlled leather seat. Now of course there are those of you who think they know better than Ford’s fancy driver-aid suite. For you brave individuals, you can disengage traction control completely in Baja mode with a seven-second press of the traction control button. But as Road & Track rather eloquently explained, you probably don’t want to do that. In most circumstances, including aggressive driving in the comfort of your own racing, modern driver aids can do more to help than hinder all but the most elite drivers. The Raptor takes that idea and runs with it. Baja mode is designed for the truck’s traction and stability systems to help make your drive faster and more fun, not cut power as soon as it detects a little wheel slip. If I can climb into a vehicle and have the tires tearing across sand in under an hour, it’s safe to say the vehicle’s making up some ground on skill level. Rock crawling is different from sand driving because you’re generally fighting against steep angles more than than a lack of traction. For this you need massive power spread across multiple wheels to keep your vehicle moving forward, which is why the Raptor’s “Rock Crawl” mode activates the transfer case’s low range, applying a 50:1 multiplication of the truck’s torque, starting in second gear to make all that power more manageable, and shutting off traction control. Steering is set to comfort to give you all the turning strength you can get. This mode is meant to pull you straight up a craggy hill, and back down again in conjunction with Hill Descent Control which is like an off-road cruise control keeping your speed in check. The 2017 Ford Raptor is an impressive vehicle on its mechanical merits alone– the engine delivers massive power with impressive volumetric efficiency (450 horsepower from 3.5-liters of displacement!) and the shocks are even strong enough to soak up a little bit of air time. At least according to the commercial. 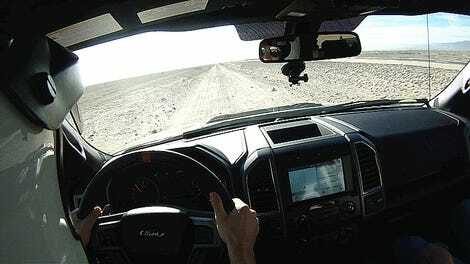 But Raptor’s Terrain Management System ties all the vehicle’s attribute together and takes its off-road performance to a level we haven’t seen in other production vehicles. If you’re just a decent driver, the thing will make you feel like a hero. But I have a feeling that even professionals will be able to appreciate how easy, even relaxing, driving this thing hard can be.